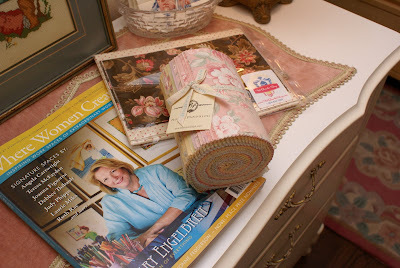 ..... a great magazine and more fabric for my stash. I've been working on these applique blocks this weekend. The blocks belong to one of my many UFOs. Maybe I'll stay motivated to complete the quilt this time around ... hmmm ... doubt it - too many distractions and new ideas. 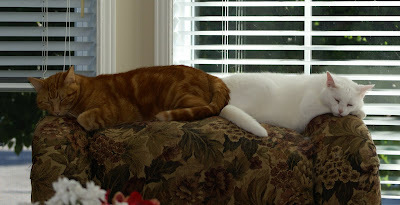 Took this picture of Ted and Sydney on Saturday morning - sharing a nap on the back of the chair. I've never seen them snuggled together end-to-end like this. 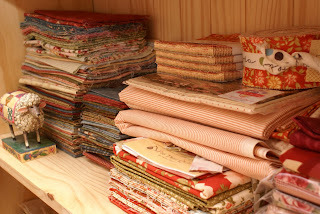 I love your fabric selection for the Verna Mosquera quilt. I have several of her patterns but I have not seen this one. Do you have a pic you can put on your bog? ..just click on the link above (The Vintage Spool)and you will be able to see a photo of the quilt on the third page of her patterns. 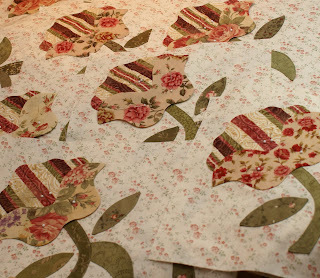 The florals and the stripe~what a great combination~ I l0ve applique! I am going to check out the pattern~ Thanks Dorothy! Hi Dorothy, I love your items. 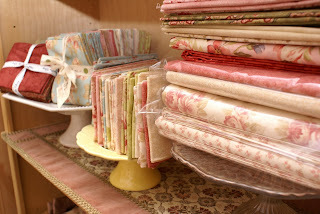 What is the September Potluck for the Hexies group for September? I am a member and I could not find any info on that. Thanks and Happy Quilting. 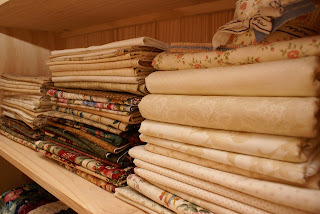 Your quilts are very pretty. On-line shopping is great.........I love it when those packages arrive. Those blocks look terrific. I love the applique and Ted and Sydney are beautiful.